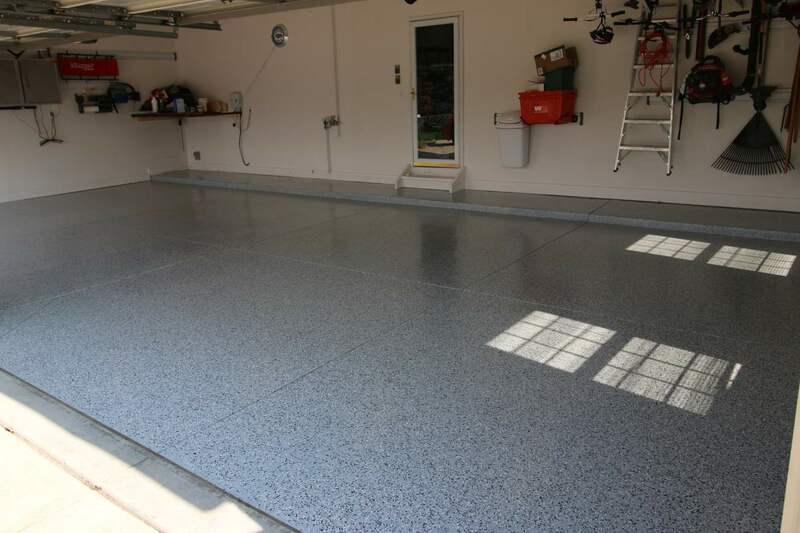 Those words truly describe my feelings towards what used to be my ugly, disgusting, dirty, embarrassing garage floor. 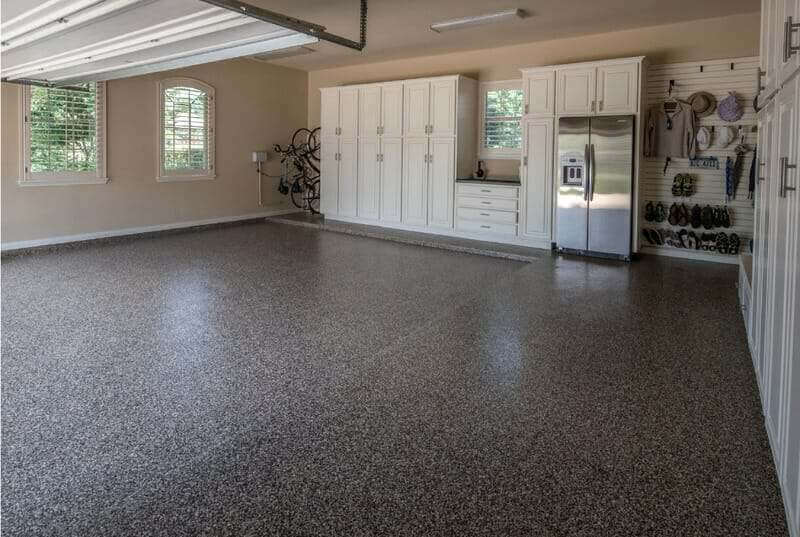 The biggest surprise is that my wife really really likes the garage floor (ok, she doesn’t have as strong as feelings for a garage floor as I do but I’m ok with that). I will immediately jump into the before and after pictures because I was just floored (pun intended) about how it turned out. I almost feel like a proud dad showing off pictures of my kids. And here is how it looks after!!! 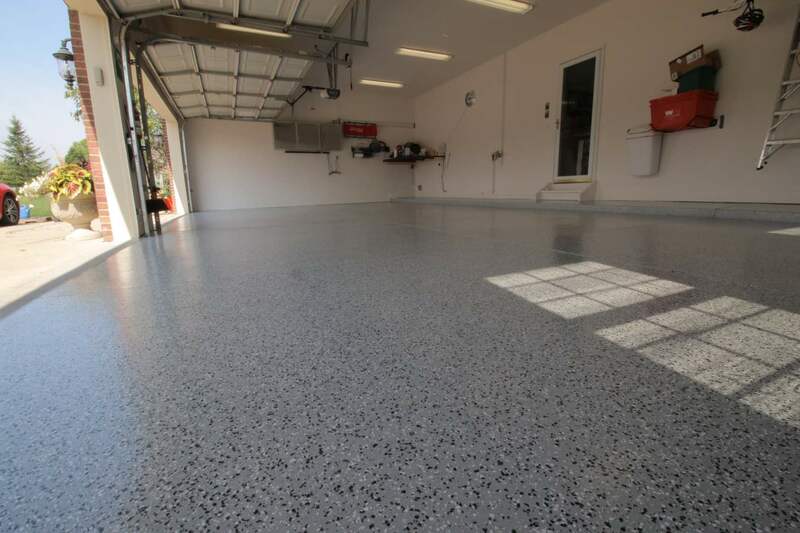 When all of our neighbors came by to look at the finished product, I kind of half joked about that I would get them monogrammed slippers that they could slip on to walk on the garage floor when they come over. I might just look into it getting everyone a pair. Now, that I have gushed about my new baby, lets get into the details. Before I started the project, I tried to do a ton of research about different epoxy suppliers, how to prep the surface, when to do it etc. 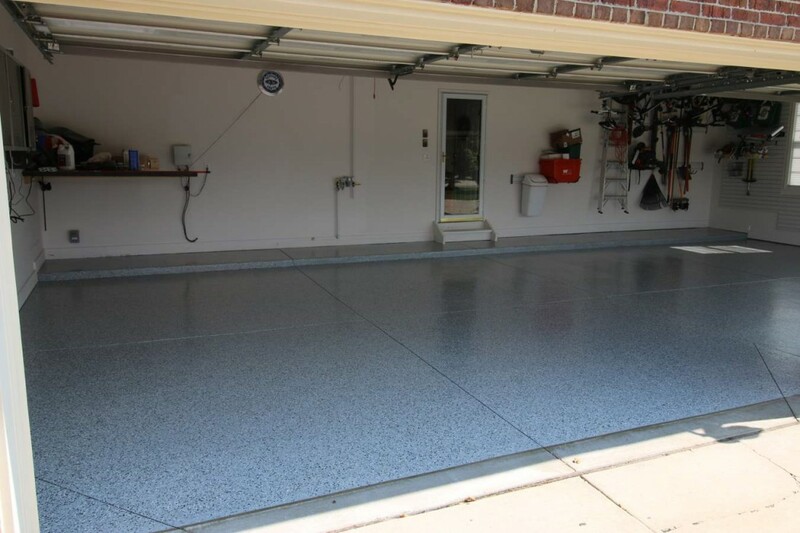 The garagejournal.com was invaluable in this research as there is an enormous amount of info and opinions on all sorts of garage flooring options. 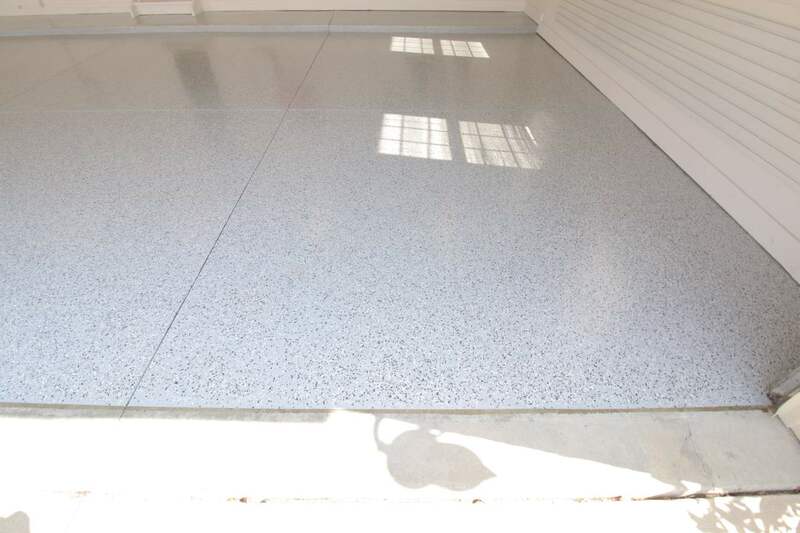 Also, professional epoxy floor installers weigh in to give their advice which is very beneficial. 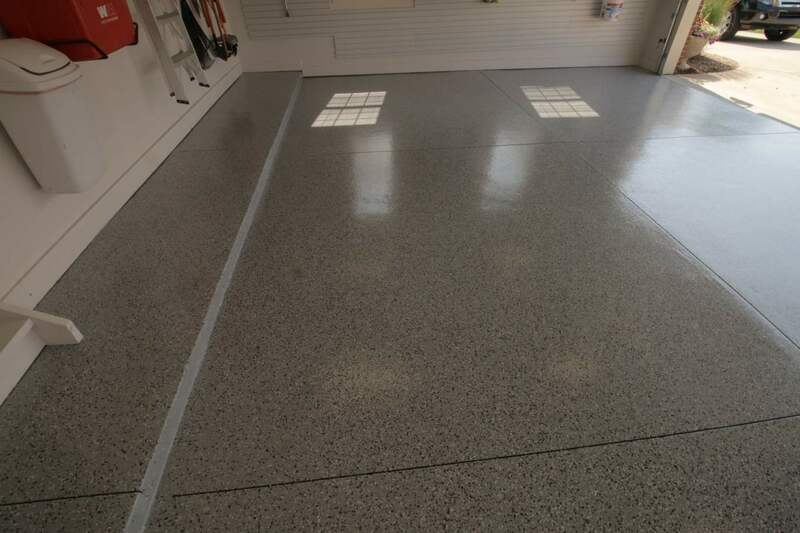 So here were my steps from start to finish in my epoxy floor journey. 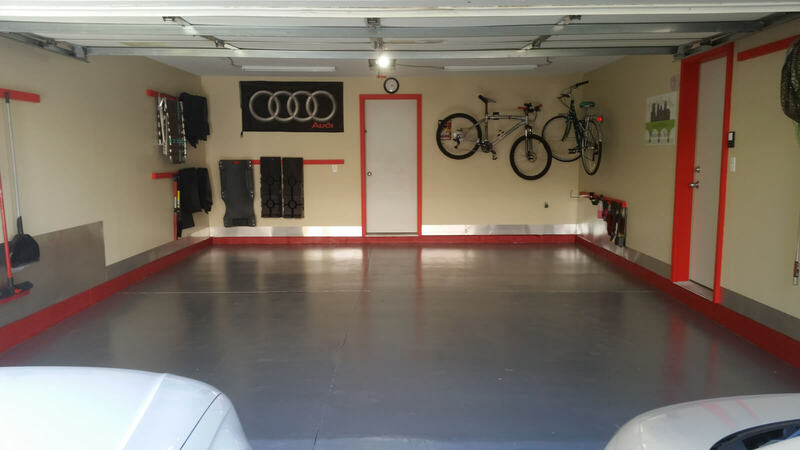 My garage is a 820 sq. 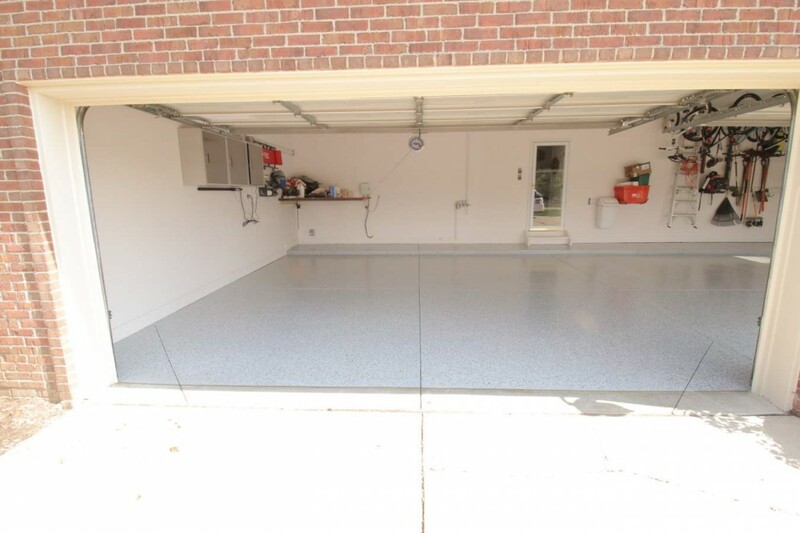 foot 4 car attached garage that is about 15 years old. 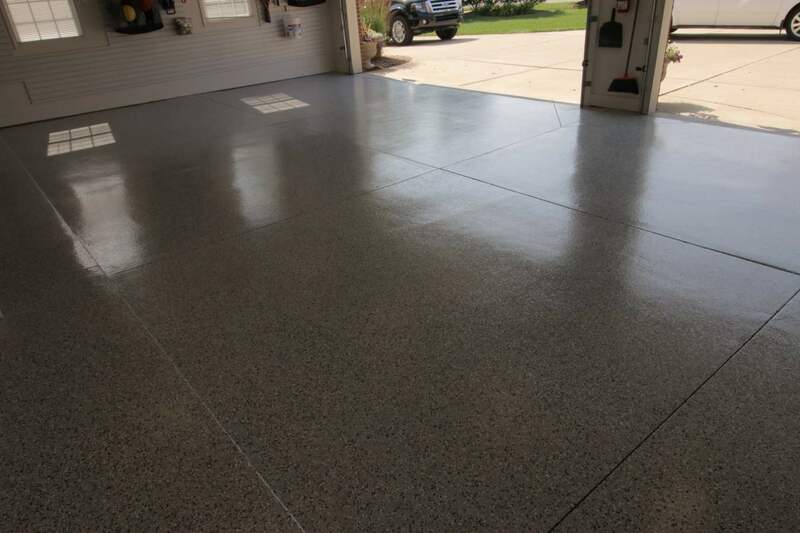 The concrete was in pretty good condition as I never had any /many oil spills or nothing else that damaged it. I live in Michigan and they use more salt on the roads here than the entire world consumes in their diet!! The salt and slush from the winters were starting to take a toll in the form pitting. I’m not the sharpest crayon in the box but telling my wife that she needed to park the car outside in the winter seemed like a very bad idea. So I decided something had to be done. 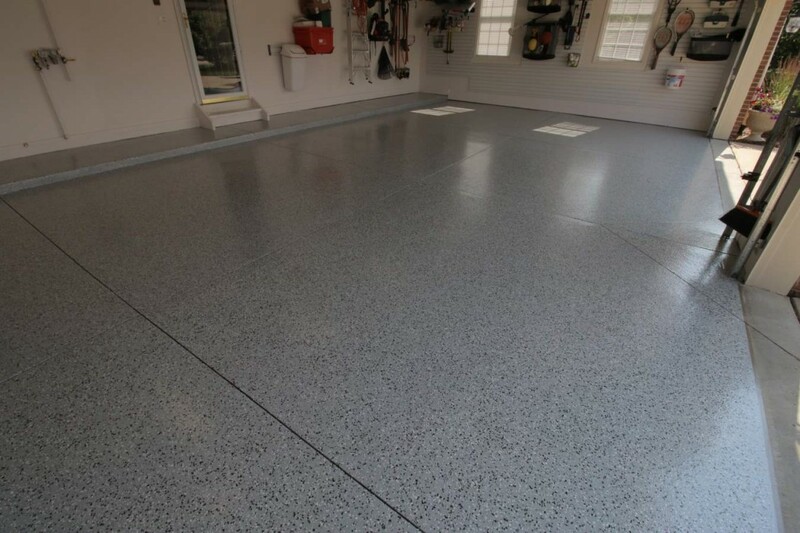 I was familiar with epoxy floors because I DIY’ed one at my previous house and my father also has one as well. I really like the look and durability of an epoxy floor BUT, I had two giant worries. 1.) I was worried that it would peel up. I had this happen at my previous house and my father on his first go around had the same thing happen. 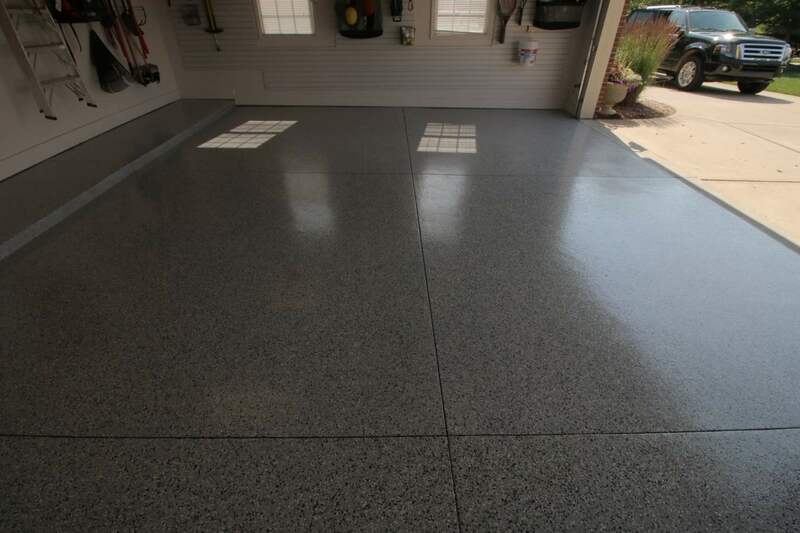 ALSO, I had painted my stamped concrete patio on the back of my house last year and it all flaked up. 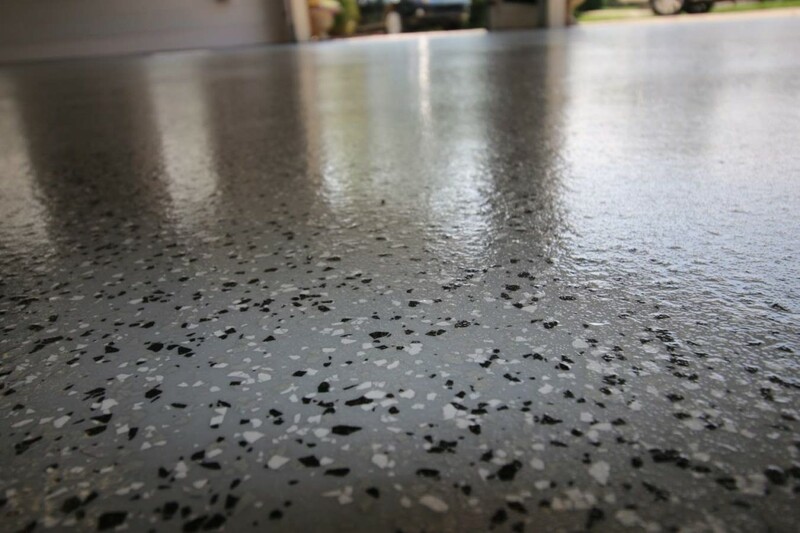 I realize that epoxy is a different product than what I used for my patio but still had the concern about putting money and effort into the project only to have it peel up. 2.) I was worried that when it got wet it would be as slippery as an ice rink. 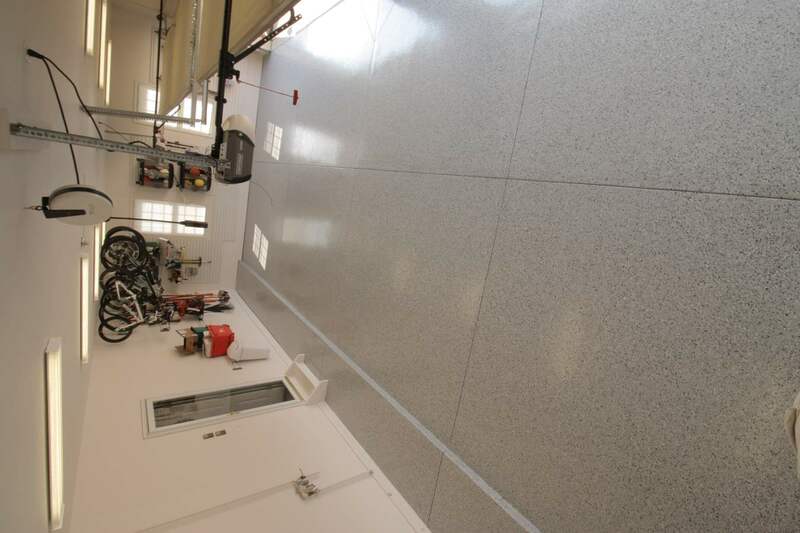 Our neighbor has an epoxy floor and when it gets wet from the snow in the winter, it is so slippery that he resorted to putting down mats to help. 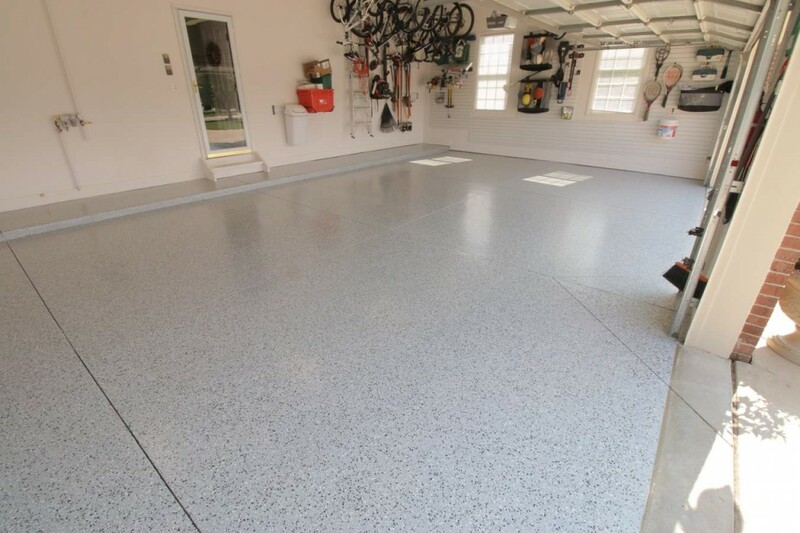 This isn’t a bad idea but it takes away from the look of the floor. So no slippery floor was a major concern of mine. 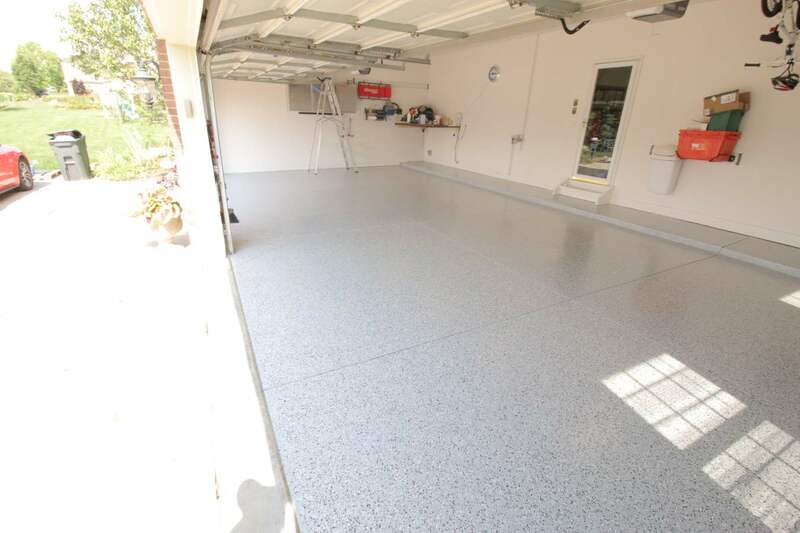 So I went online to possibly find a different garage flooring solution. 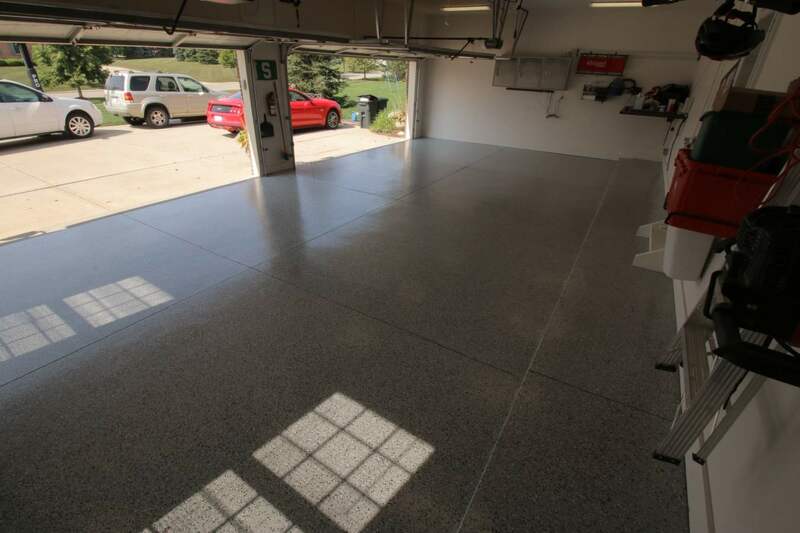 I immediately found the garagejournal.com board and spent hours in the flooring forum. I started liking the idea of the vented snap together tiles. 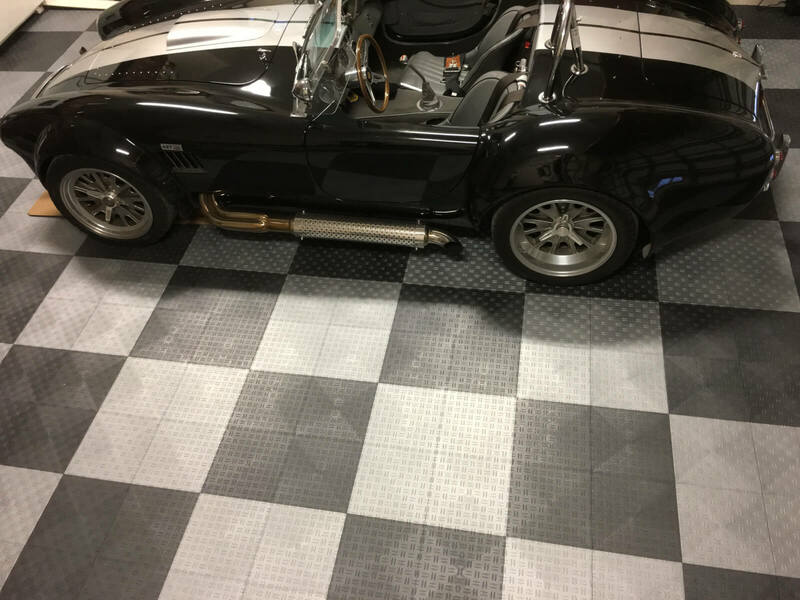 The tiles would alleviate my two biggest worries in that they wouldn’t peel up and they would not be slippery as all of the snow / water goes underneath them. Plus, they are literally and figuratively a snap to put together as I figured I could be done in a day installing it. So I got some tile samples and showed the family. My wife and kids (and some neighbors) looked at them and none were impressed about the look. I got the “Well if you really like them I won’t stop you from putting them in” response from my wife. So my 20 years of experience with her I took that as no… So back to epoxy…. After looking online more I really started to like how the epoxy looks based on the colors and flake patterns available. So long story short, I decided to go the epoxy route. 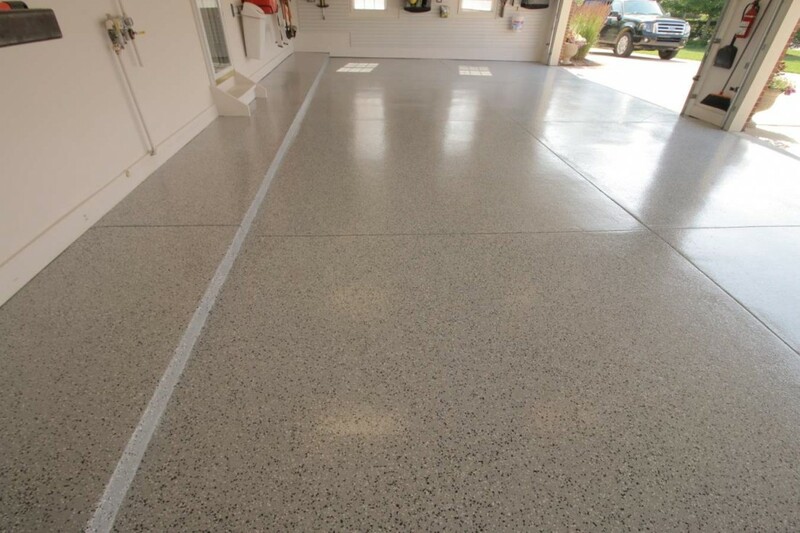 There are a number of companies to choose from for epoxy. 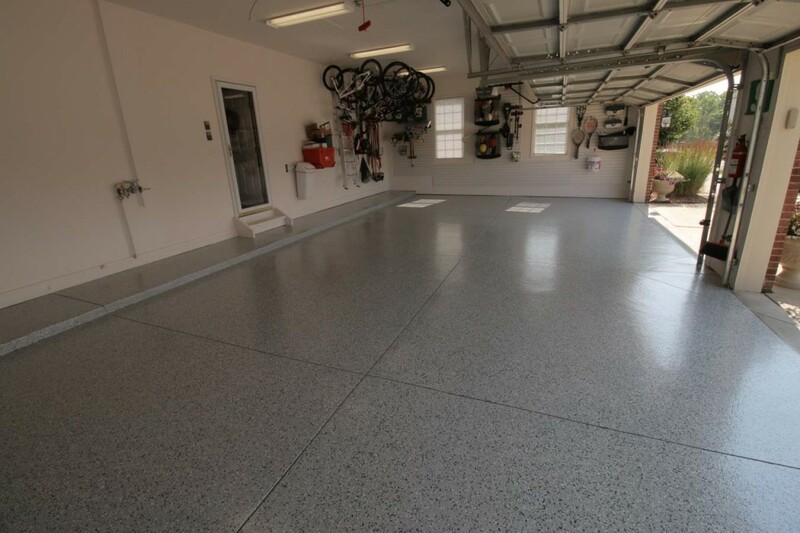 With reading many of the post in the flooring forum at the garagejournal.com, I decided to go with Garage Flooring LLC. 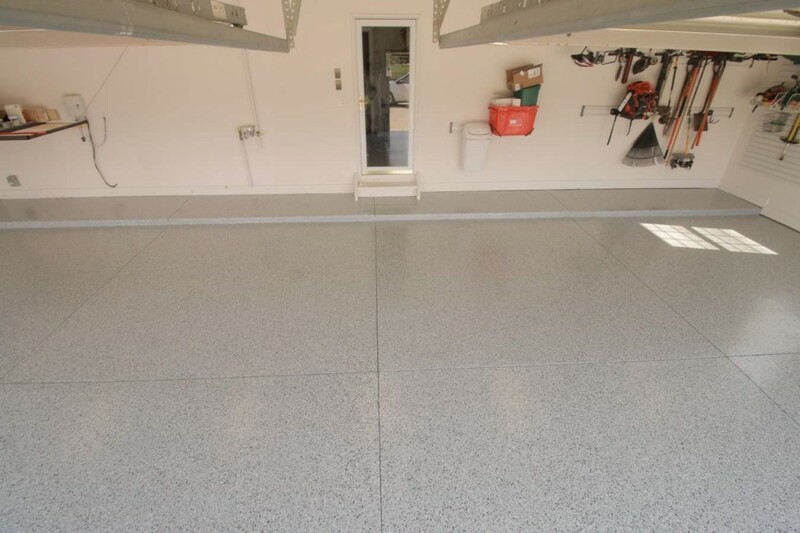 Justin Krauss is the owner of Garage Flooring LLC and in all of his replied to posts, he always was helpful, provided a lot of information and also even complimented other competitors. 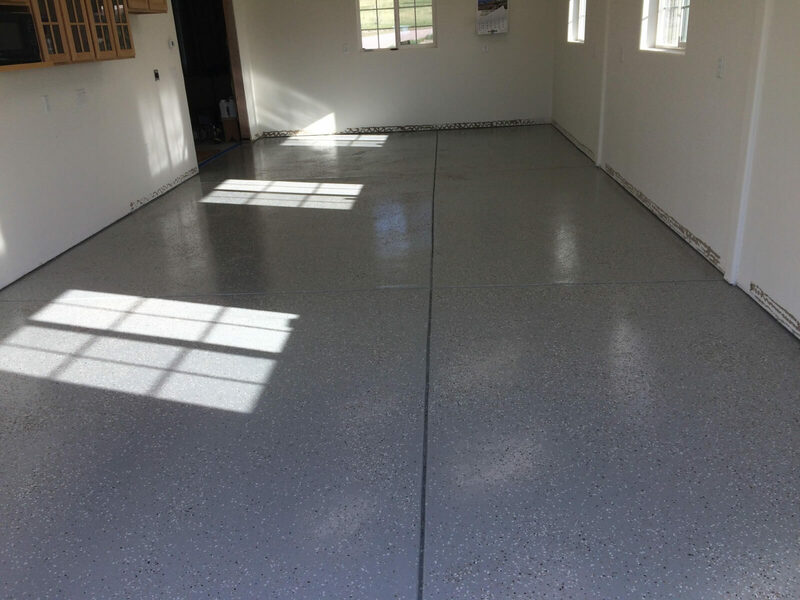 So I chose to go with Justin as I value all of those traits and I also felt that I could contact Justin with questions as I was nervous about doing epoxy and wanted to “do it right” this time. 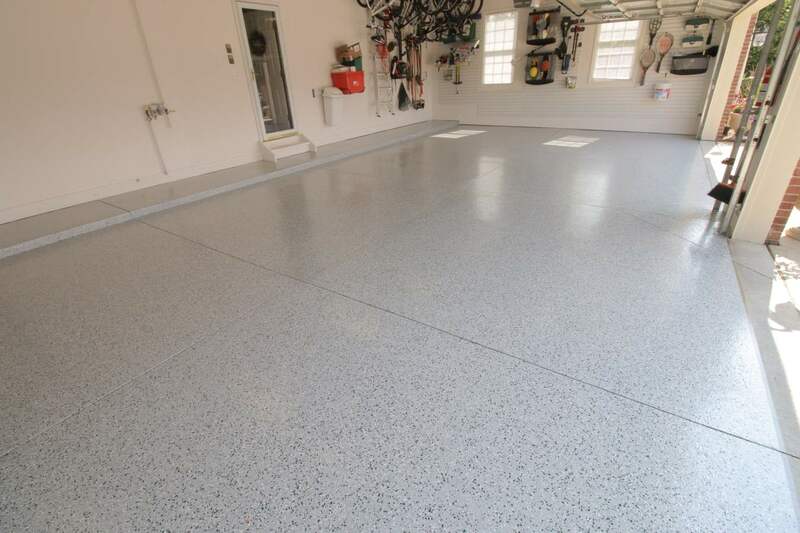 The one thing that is recommended before laying epoxy is to do a moisture test by taping plastic on the garage floor to see if any moisture is present. If there is, than the epoxy will have problems staying stuck to the surface. So again, I didn’t want any peel up of the epoxy so I made sure to do this test. I had no moisture issues at all so yeah!!! 15 lbs. 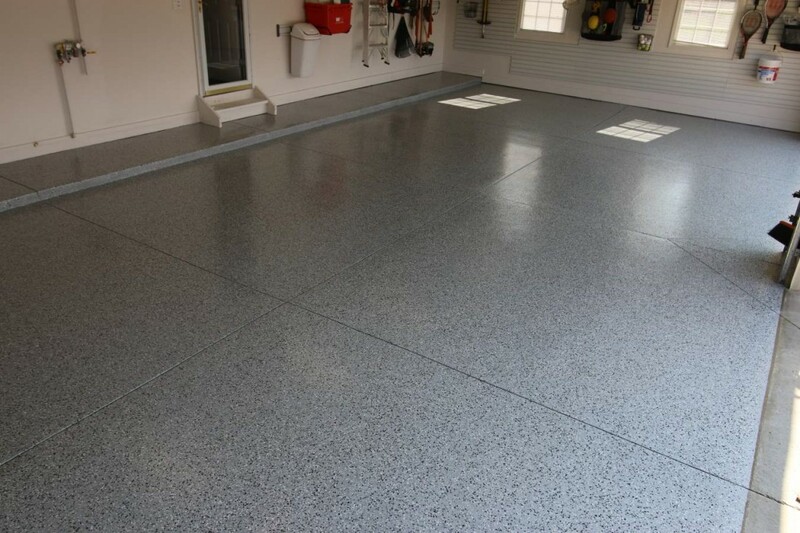 of 1/8” flake in black, grey and white (B411 blend). 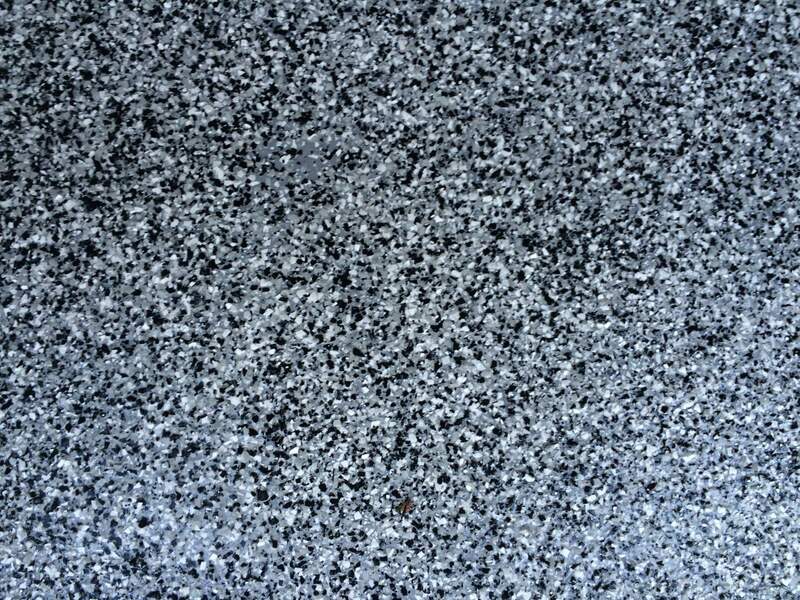 I told Justin I didn’t want full broadcast coverage and was going for a “granite” look. So this is what he recommended. It took about 4 business days for the materials to arrive and I could not wait to get started. I talked to and emailed Justin a number of times regarding what materials were need (what kind of rollers, what size nap of the rollers and so on). With his guidance I purchased most of the supplies either through Amazon or my local Home Depot. 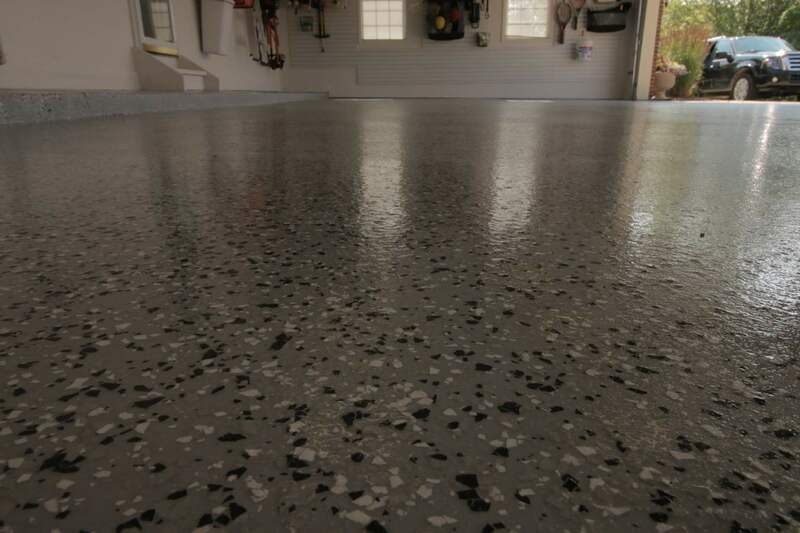 I planned to do my floor the week before the 4th of July as I was planning on taking that week off of work anyways. Seemed like I would have plenty of time to complete the project. 1.) 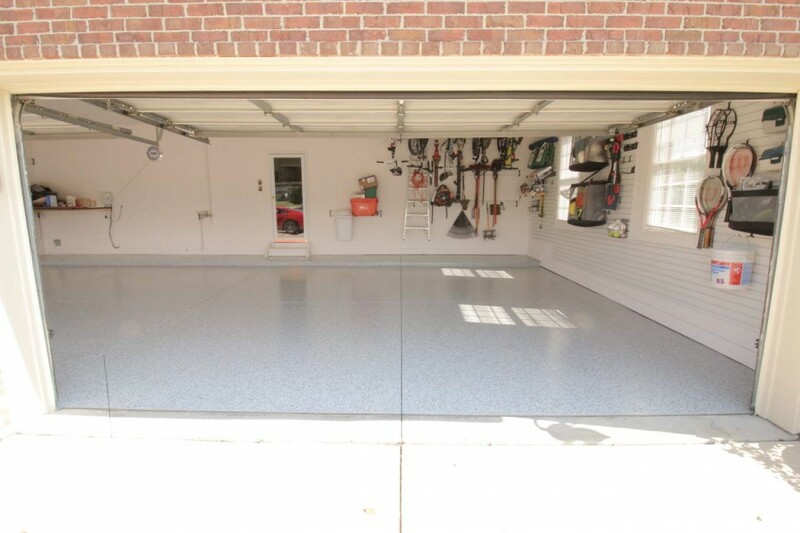 Clear out the garage – I had the HUGE benefit of my neighbor allowing me to store my big stuff such as my workbench, tool chest, rolling cabinets and riding mower in the garage for the project. So I moved all of big stuff to their garage and put the smaller stuff in my attic or basement. 3.) 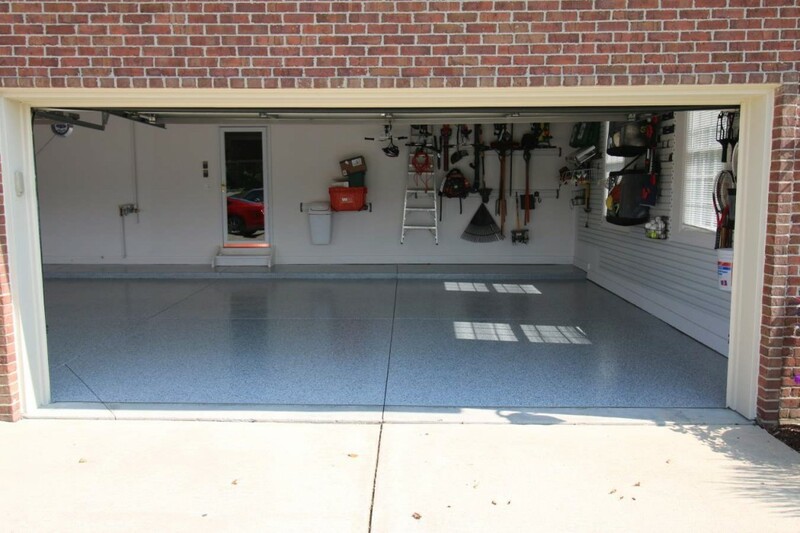 Apply the Pour N Restore oil stain remover – There were a few spots where I had some small oil spots. I put down the Pour N Restore, let it dry and then swept it up after it dried. 4.) 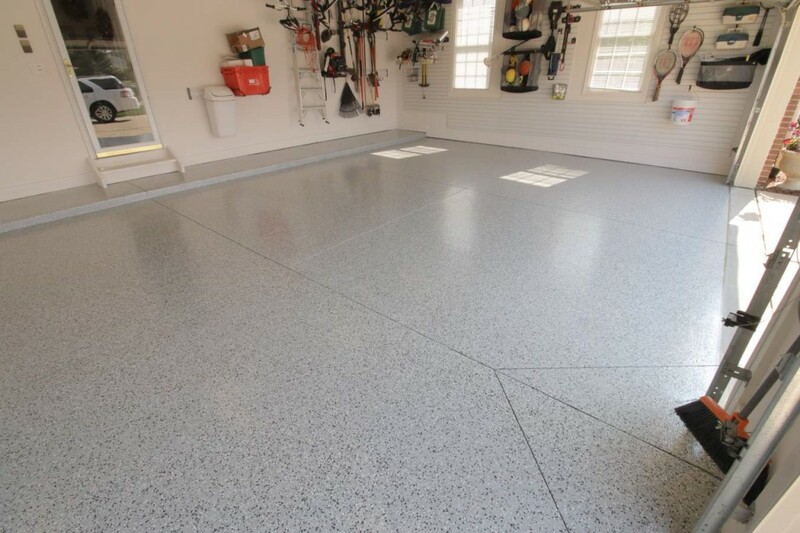 Degrease – I put the metal blast down in a few spots to clean / degrease the surface in a few of the spotty areas. 5.) 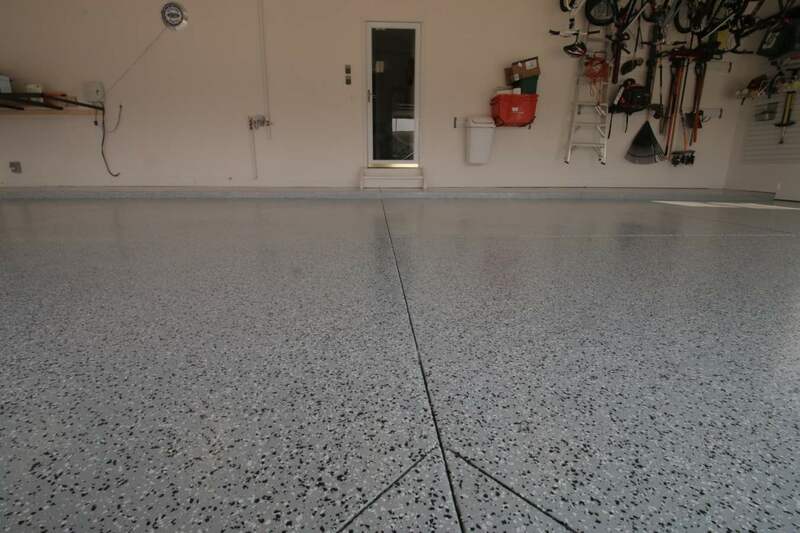 Patch – I had a few small areas that had divots in the concrete that were about 1/8”-1/4” deep. 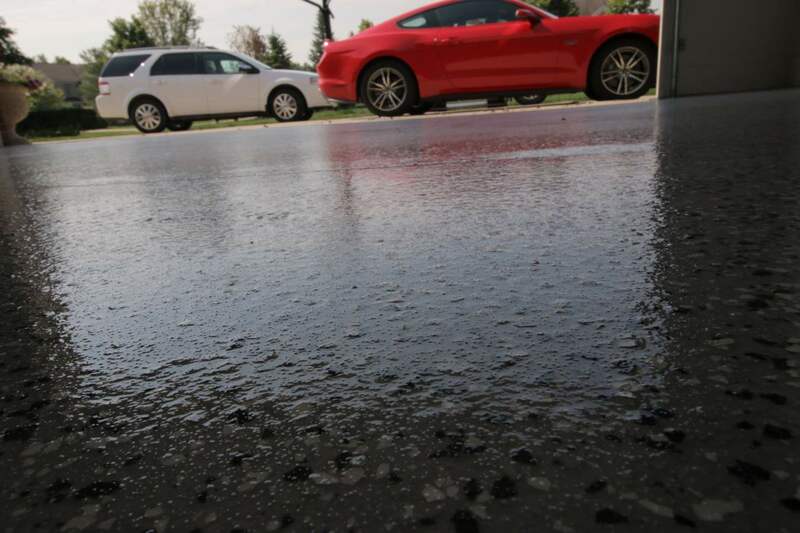 I also had again quite a bit of pitting from road salt. So my plan was to fill these divots and try and fill the pitting much like you would do with spackling on a wall. 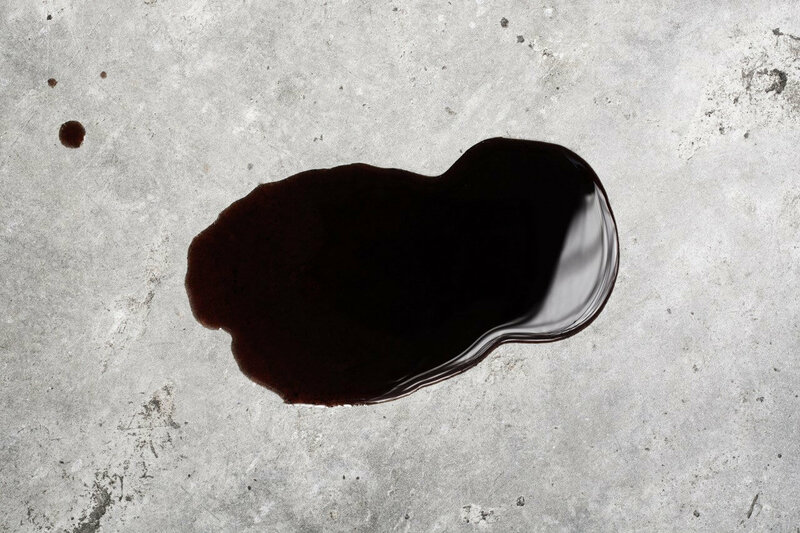 An email exchange with Justin and he told me “just mix it all together and put it on but be prepared to move fast as it dries quickly”. So I enlisted the help of my wife as I had about 5-10 sq. feet of stuff I was expected to fill in. HOLLY COW!! Justin was right. I mixed the patch kit and I had 5 minutes before the material was not workable. It wasn’t a big worry to me though. I filled the big holes first and came to the conclusion that the small pitting from the road salt was likely going to be covered with the 100% solids epoxy (turns out it did). 6.) Grind – Oh boy. This was the one step I was most nervous about. In my previous house I did the acid etch only. 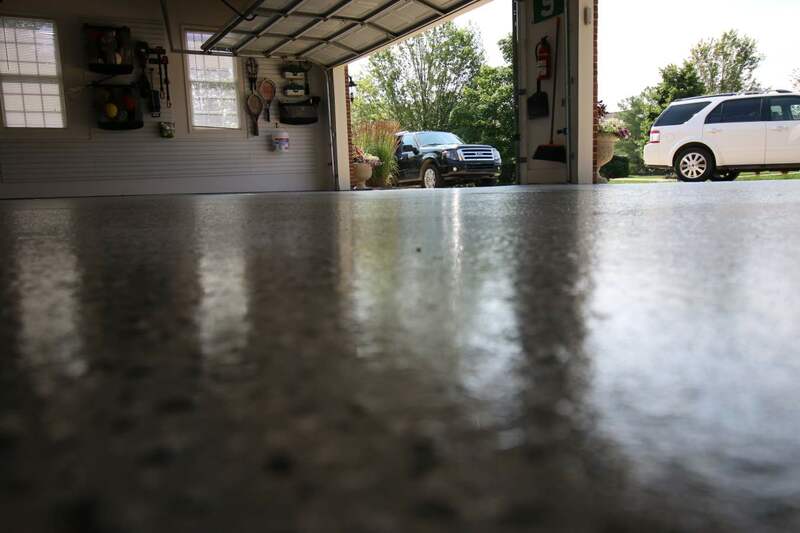 After reading online, it sounded like grinding was the absolute best way to prep the surface. 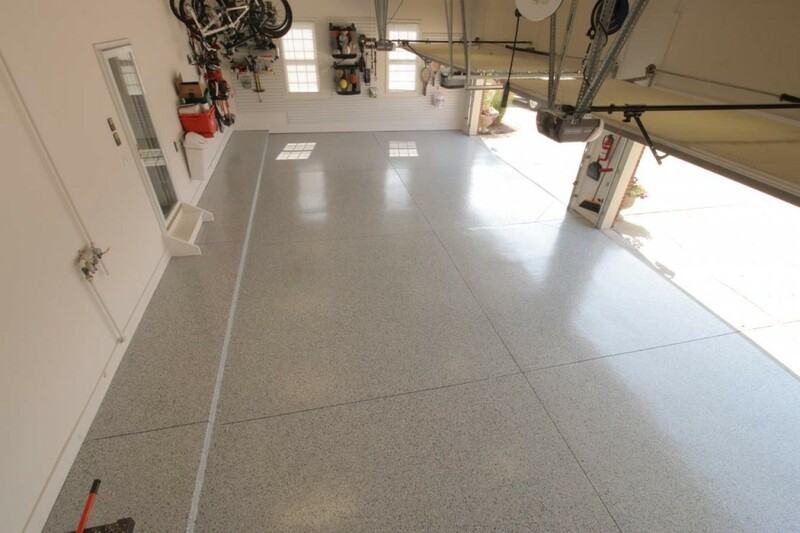 EVERYBODY agrees regarding epoxy floor that the prep work is the most important. So I didn’t care how long it was going to take me, I wanted to do it right and grind the floor. I was all nervous about how much dust would be made and how big a mess would be made. 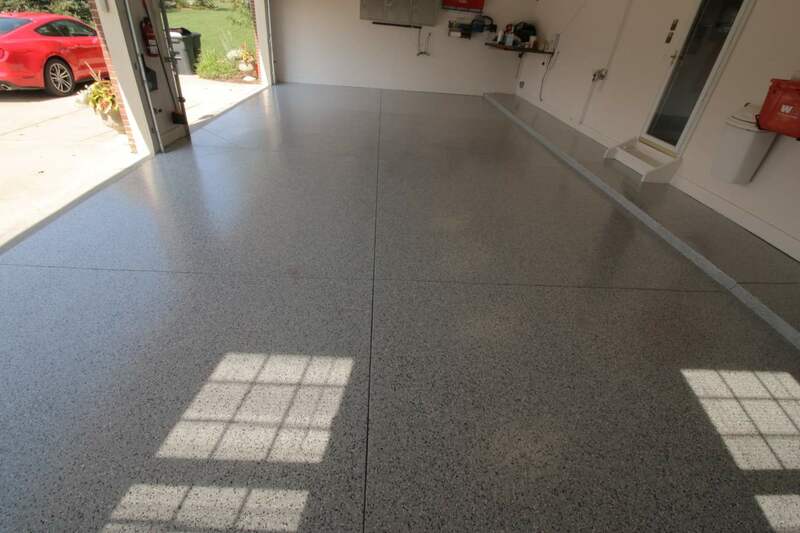 So the decision was to rent a Clarke floor polisher and Diamabrush concrete floor preparer from my local Home Depot. Overall the grinding process went MUCH easier than I expected. 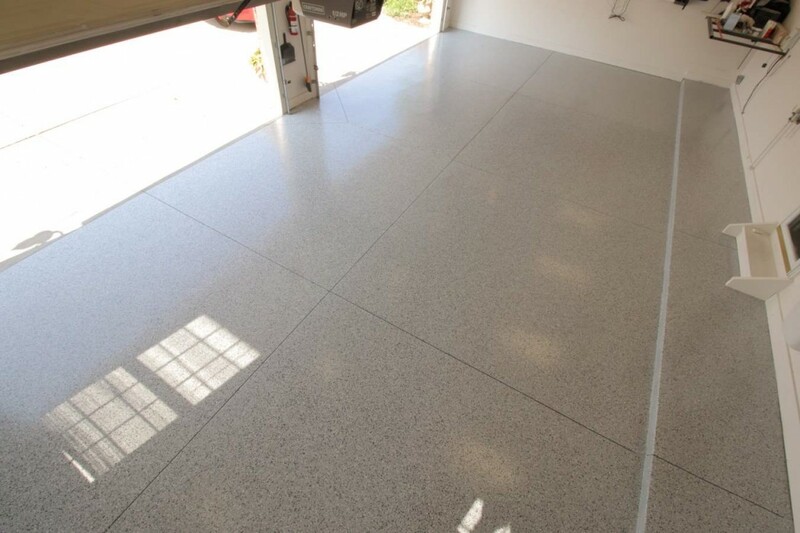 The Clarke floor polisher was very easy to control and it was not physically demanding. 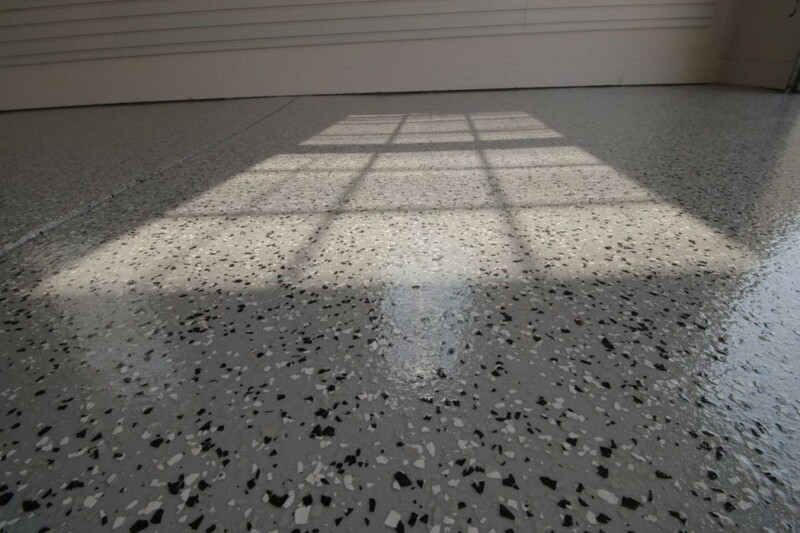 It did take me about 7 hours to grind my 820 sq. foot floor but literally I just had to stand and put light pressure on the machine to move it. 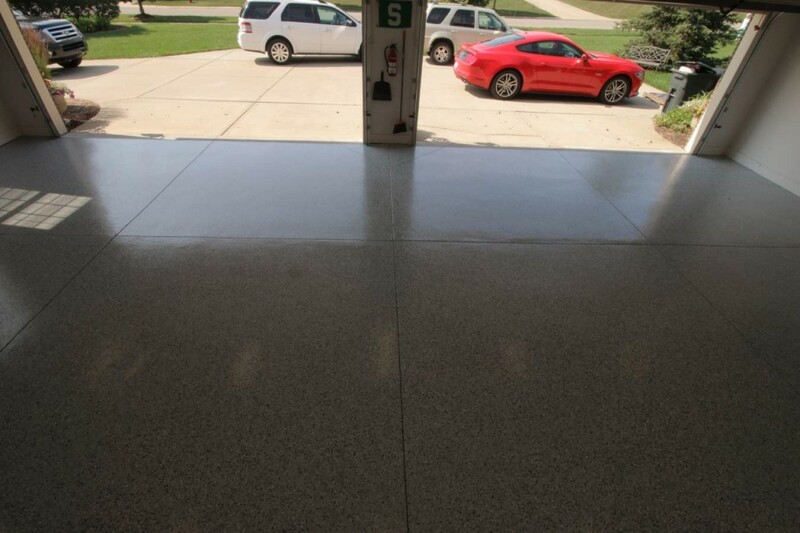 Dust was NOT an issue as the polisher turns at a slow RPM. So the grinding step went much easier than I expected. 7.) 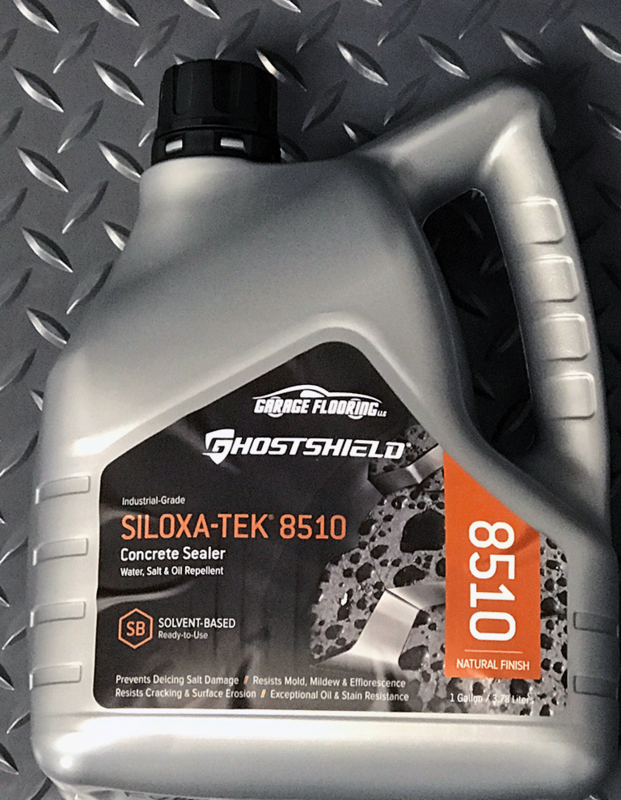 Angle grind – Next I rented a Makita angle grinder from Home Depot as well and bought a Diamabrush 4.5” diamond wheel. At first the angle grinder was a little hard to control as the real problem is that it just turns too fast (like 10,000 rpm). So I eventually turned to just blipping the power switch on the grinder to keep the speeds down. 8.) Fill joints or not – After the grinding phase, I was all set to fill in my saw cuts. My four car garage has saw cuts to make 8 equal sized concrete sections. After much contemplation and looking online, I decided that I actually LIKE the look of the saw cuts so I decided to NOT fill them in. 9.) 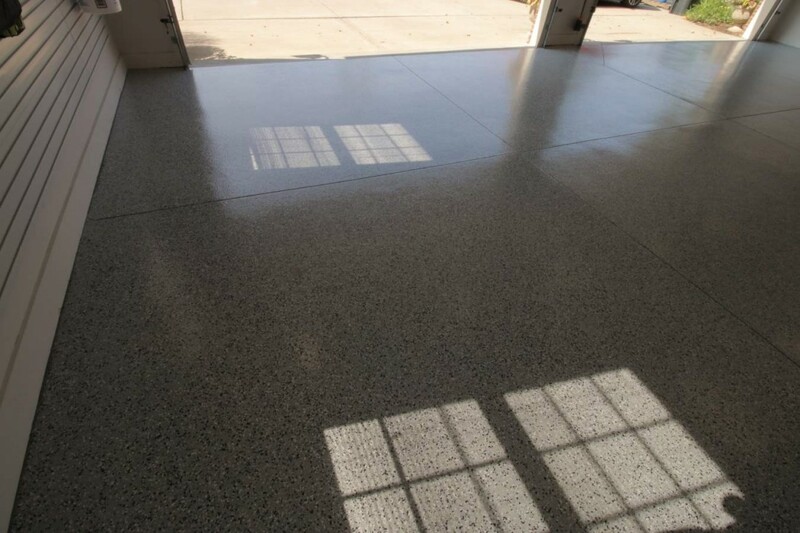 Wipe down surface – After grinding, I did not want to hose down the surface to get all the dust off. This was because I had read that after hosing down you sometimes have to wait 2-3 days before being able to start putting down primer. The first step was to take my backpack leaf blower to get the heavy layer of dust out. I made quite the cloud going through the neighborhood but it was fast and effective. Next, I took a squeegee and would take a damp towel and put it underneath the squeegee to basically wipe down the surface. 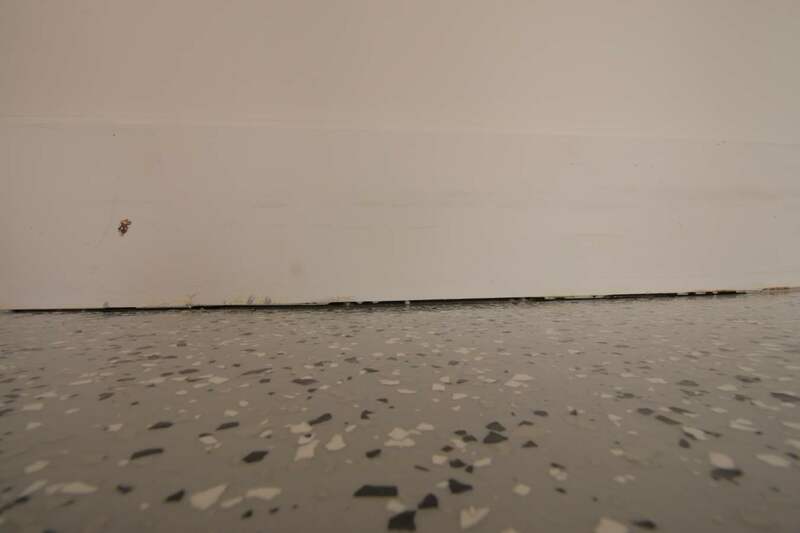 Because I was not flooding the surface with water, I was not too concerned that the floor was going to get too wet. I went over the entire surface 3 times on one day on 3 times the next day. Also, one of the times I wiped, I moistened the towel with denatured alcohol as I had heard this was good to use as well and would dry up quickly. My final test was to wipe the surface with my black work gloves. They were still perfectly black after wiping down so I figured I was good to go. 10.) Primer – The first step toward getting towards the end. 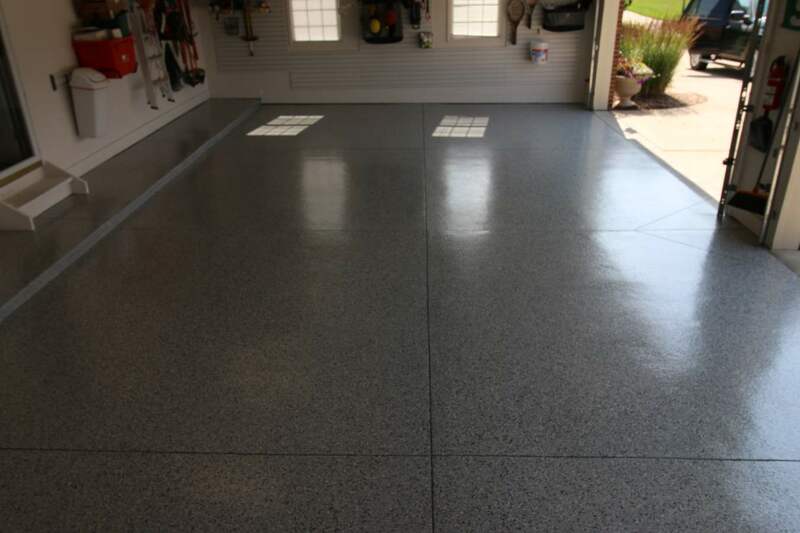 I mixed the primer just as recommended and had my wife roll (she is the painter in the family) with an 18” roller. 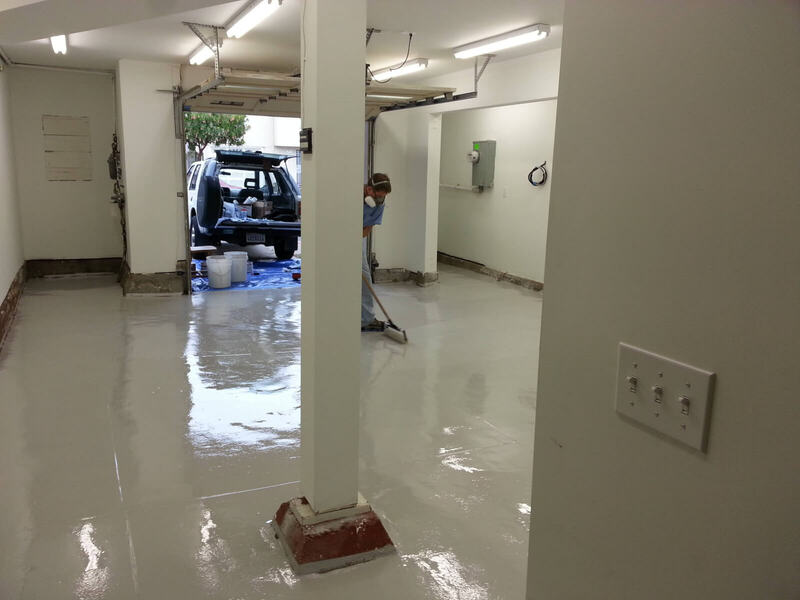 The process went fairly quickly and I was surprised that the primer did not have a very strong smell to it. So the plan was to let it dry overnight and coat first thing in the morning. But….. 11.) Primer – is it dry? – So I got up Monday morning. The primer had about 12 hours to dry right? So I do the “finger print” test and guess what? I still left a fingerprint in the primer! My worst nightmares I thought were starting to happen, that is, somewhere I made a mistake in the process and I was going to have to do something drastic (like strip the primer off) and start over. So I frantically sent Justin an email at 6:30 in the morning (eastern time) asking “what do I do now”. About 45 minutes later (keep in mind that is 5:15 am in the time zone Justin is in), he responds back. 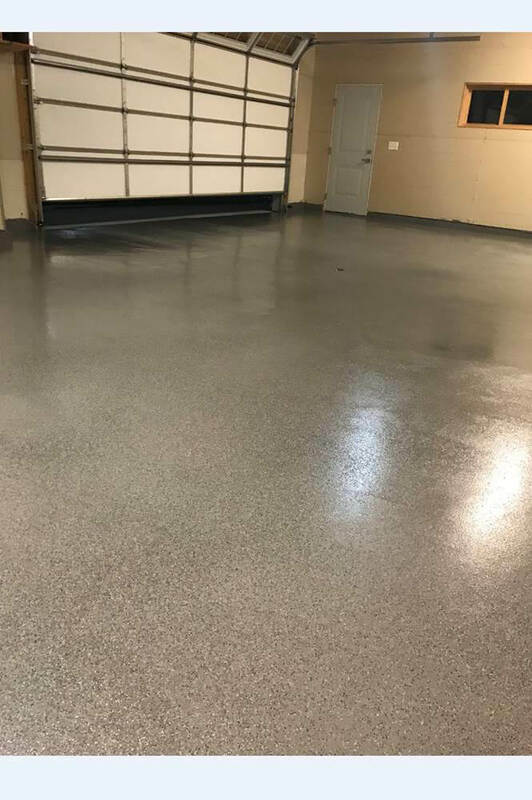 He had contacted the production plant and they indicated that it sounded like the primer was curing, but it likely just needed to have more time to dry. 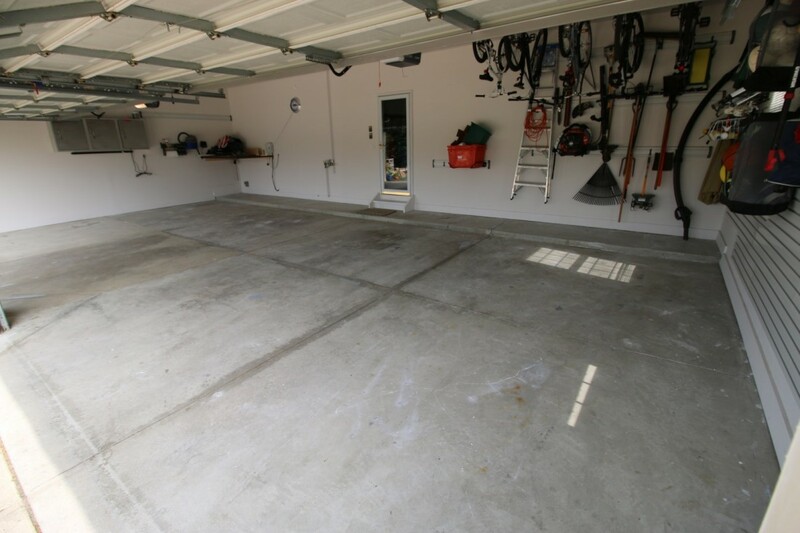 So the recommendation was to put fans in the garage. 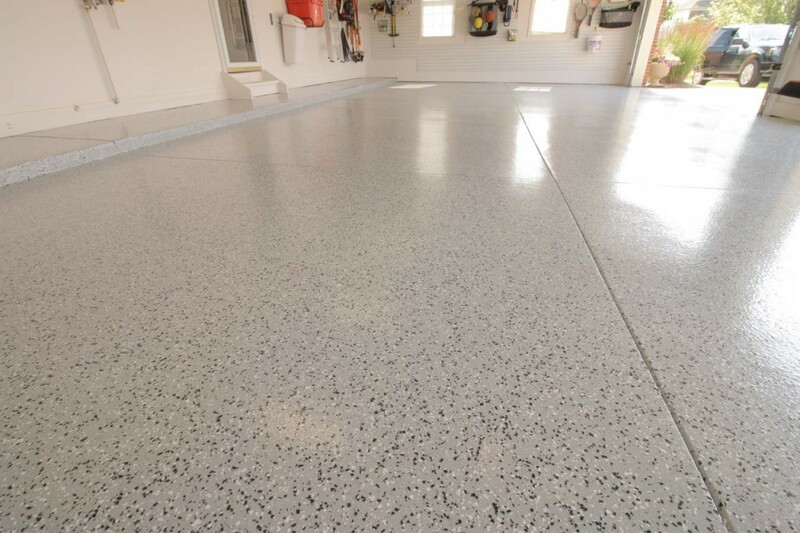 Sure enough after about 6 more hours with fans going, the primed floor passed the finger print test. 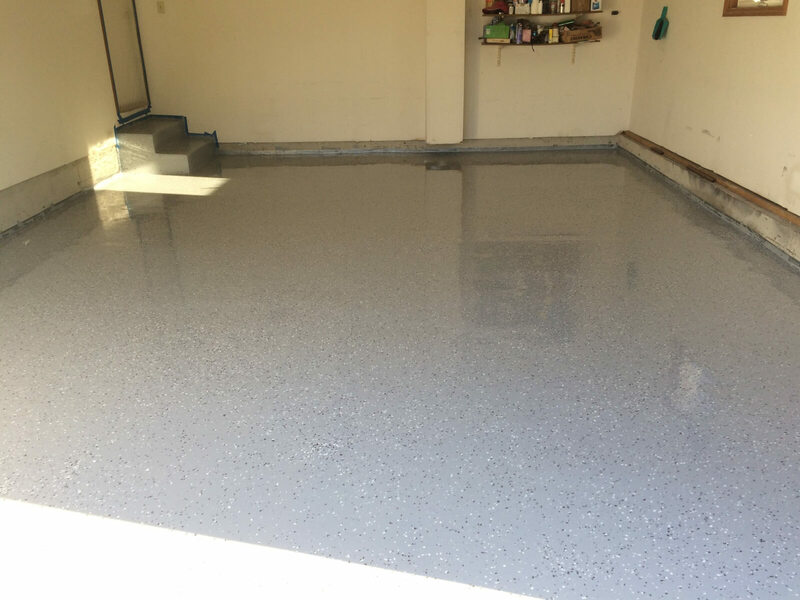 On to epoxying we go!! 12.) 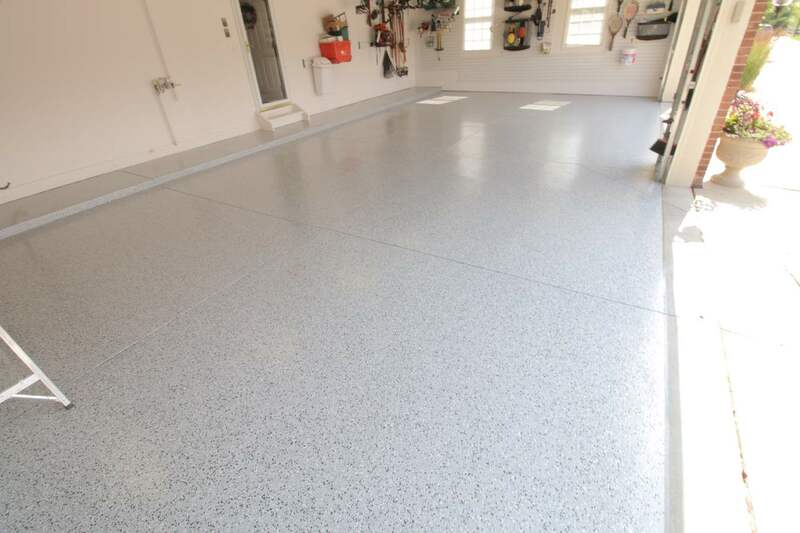 Epoxy and flake – My plan for the epoxy portion was to mix each kit (which is 1.5 gallons) and do ¼ of my garage at a time. I had my father as the mixer, my wife was the roller and I was the “flaker”. 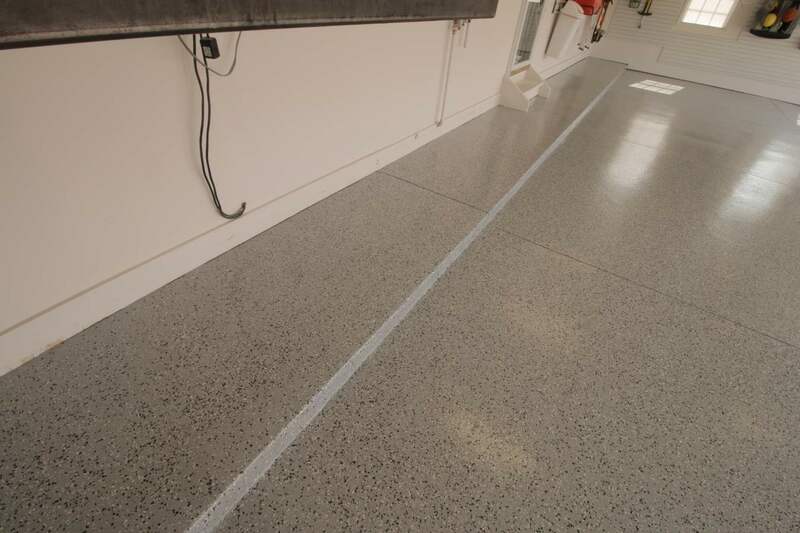 It is a lot easier to do the epoxy step with at least two people and actually the third person helped. So my father would mix a kit, then my wife would do the cut ins near the walls while I poured the epoxy out of the mixing bucket into ribbons on the section we were doing. 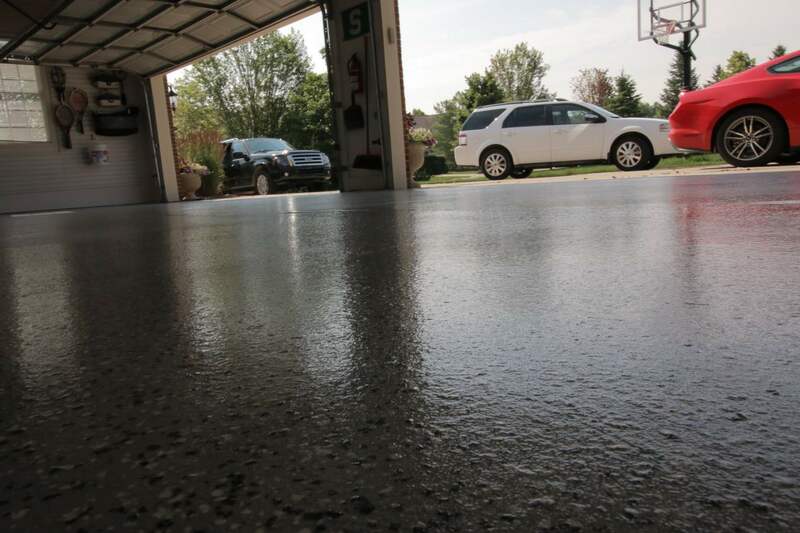 Then my wife would back roll the epoxy with an 18” roller. Then I would go out onto the floor with the spiked shoes. I personally would recommend the shoes as it was much easier to flake with. So the flaking part was the second thing that I was most worried about (the first thing was the grinding). My worry was that I was not going to get uniform flake coverage. Well it turns out the flaking was EXTREMELY easy. I started in a corner (where we usually put yard tools) so I figured any mistakes in learning process in the corner would be covered up anyways. Turns out, flaking is easy. I would just grab say ¼ to ½ a handful and shake my hand while gently letting the flakes slip through my fingers. It was easy to tell where more flakes need to be put down. 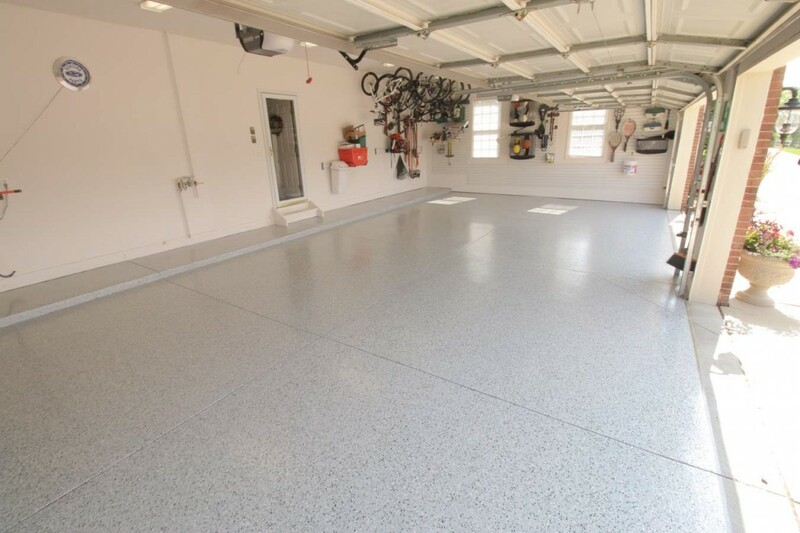 If somebody went though and counted all the flakes in each square foot of my garage I am sure there is a little bit of variability but to my eye, it looks quite uniform. 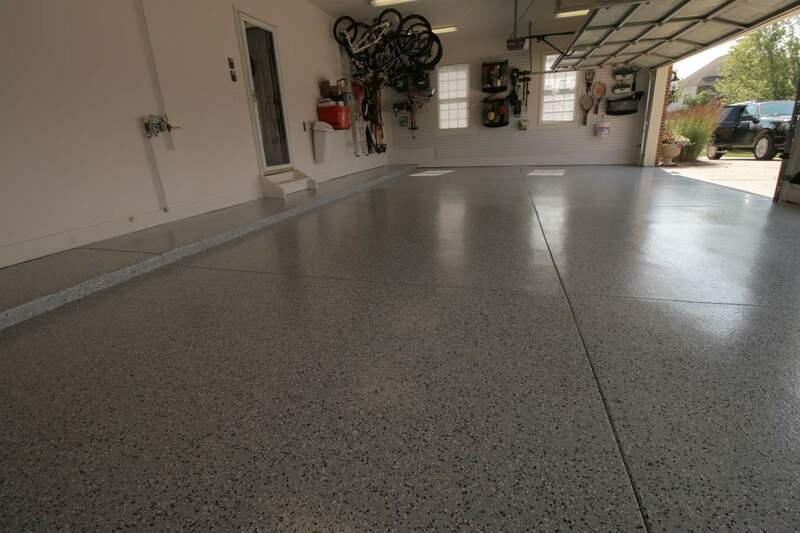 So we continued to do this mix, cut in, pour, backroll and flake process for all 4 sections of the garage with no problems. 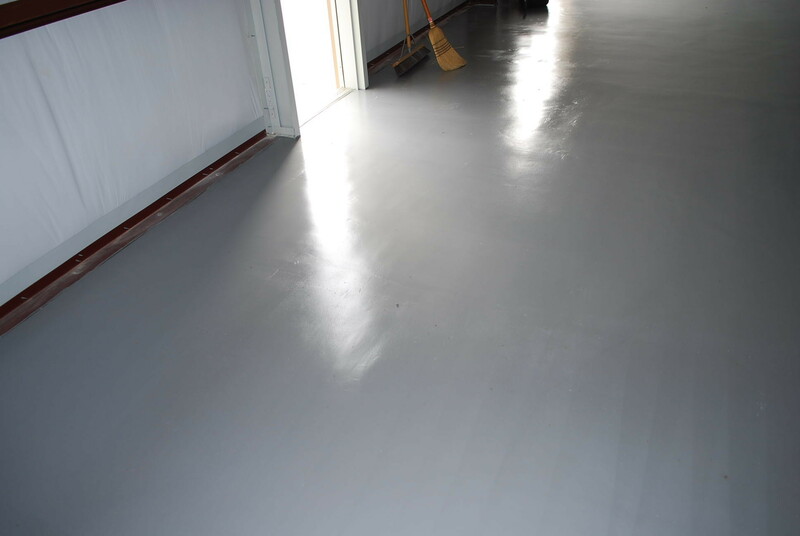 I was surprised that the epoxy did not much odor to it either but we did wear respirators. 13.) 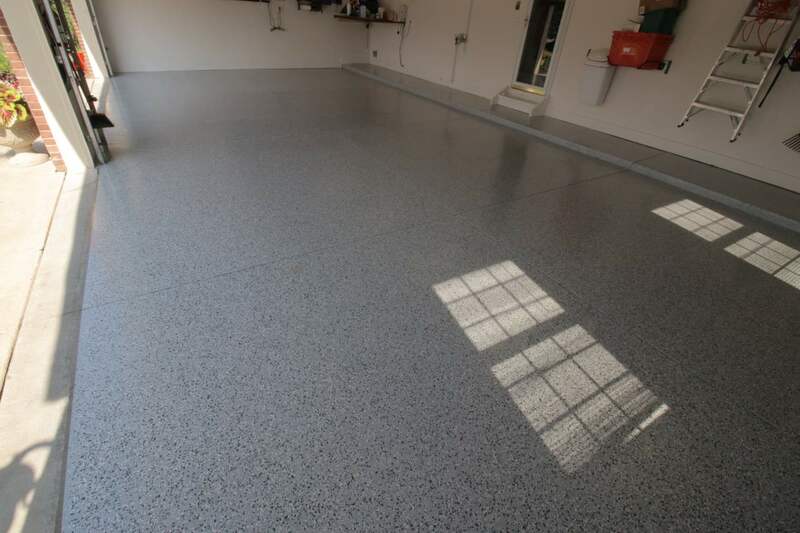 Clear coat 1 – after letting the epoxy dry for 12 hours, we then put down the 1st layer of clear coat. This process was much easier as the pot life of the clear coat is much longer so we just mixed the necessary amount and put it down. 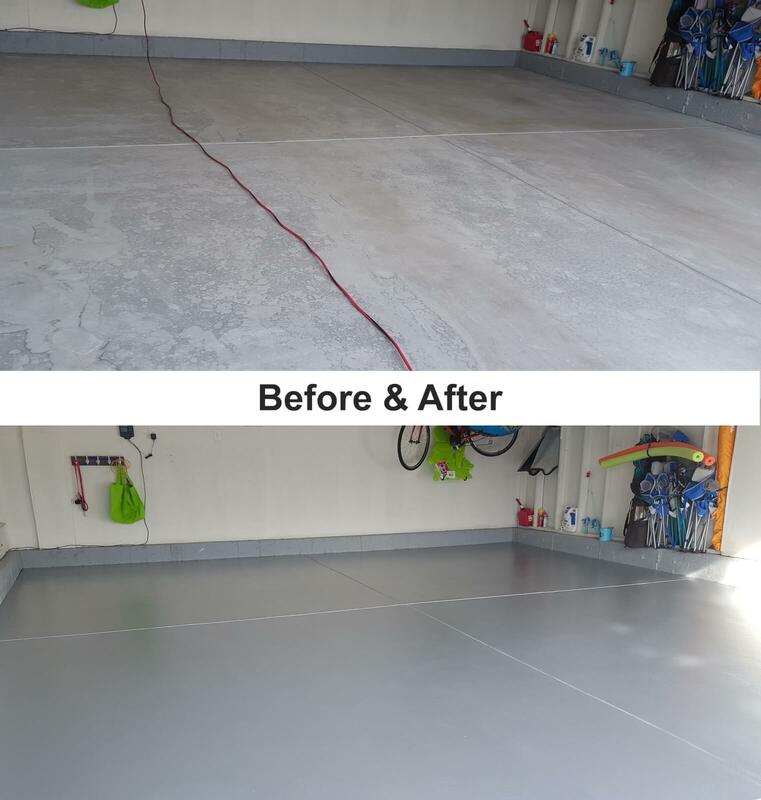 I did the cut ins this time and my wife used a 18” roller with a pan. The clear coat does have a very strong odor so respirators were definitely required. 14.) 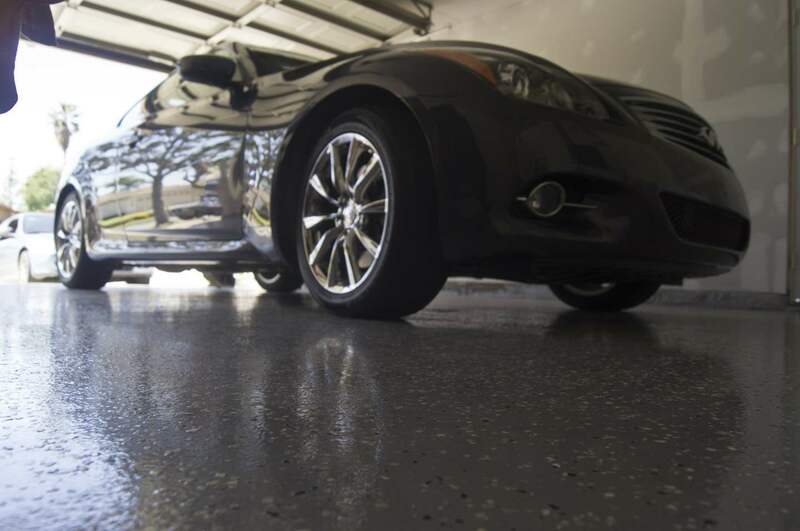 Clear coat 2 and anti slip – after letting the 1st clear coat layer dry on to putting down the second coat. 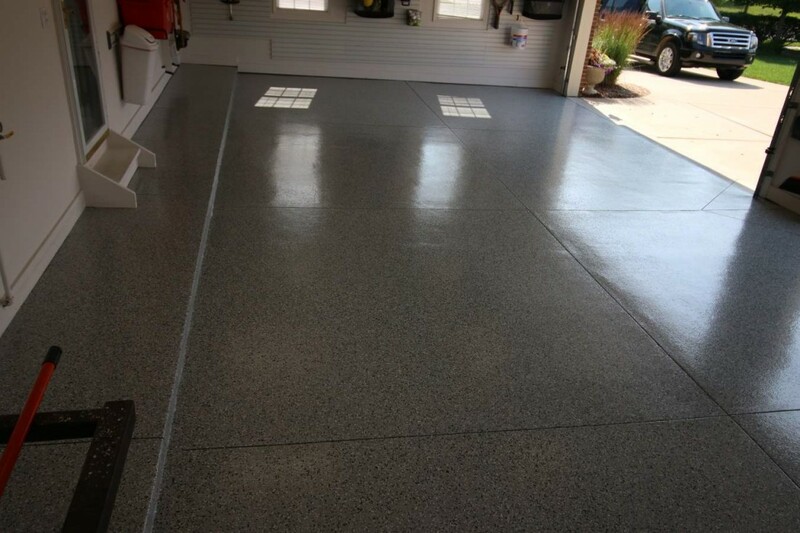 In the second coat I mixed in Sharkgrip anti slip additive to the clear coat. Again one of my major requirements is that the surface NOT be slippery when it gets wet. So I mixed the sharkgrip with the clearcoat. 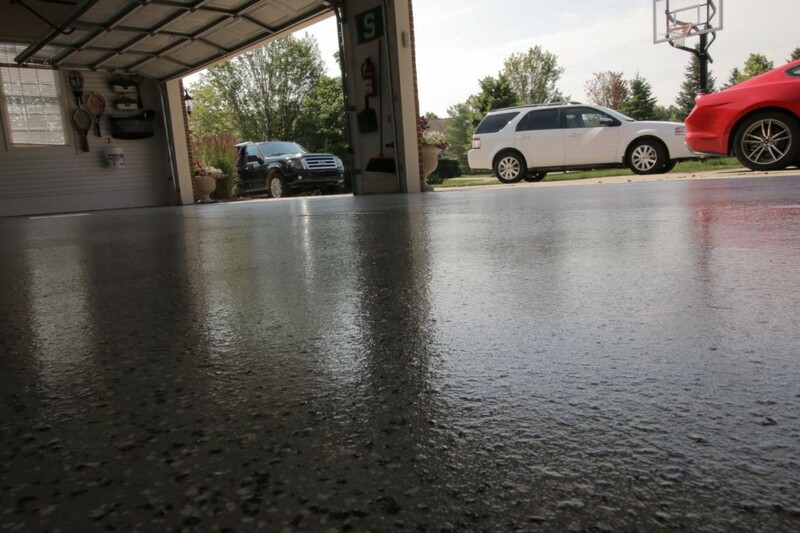 Again, I did the cut –ins along the walls and my wife rolled with a new 18” roller out of a rolling pan. 15.) FINALLY DONE!!! 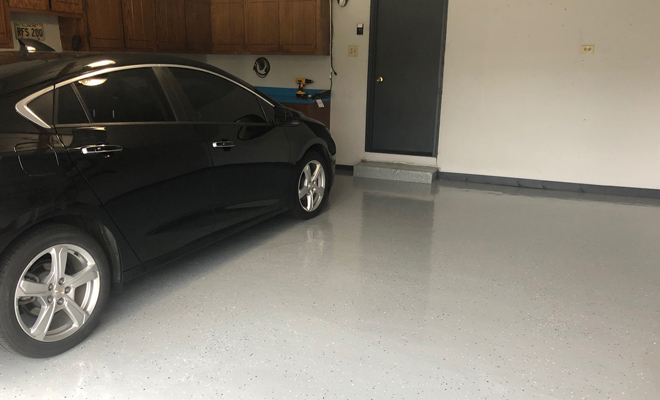 After the 2nd clear coat dryed for about 24 hours, I felt comfortable about walking on the floor (I didn’t roll anything back into the garage at this point). In closing, I was extremely pleased with the support Justin provided to me through this process. I called him and emailed quite a bit and he was very responsive and helpful. So I am sure his email inbox will be much smaller now that I am done. DID I MENTION THAT I LOVE MY EPOXY FLOOR!! Here are a few more pictures of it!! two years ago I used an epoxy product with the flakes. I used an acid cleaner several times, being the floor was 25 years old. It made a big difference. I applied the product as directed. 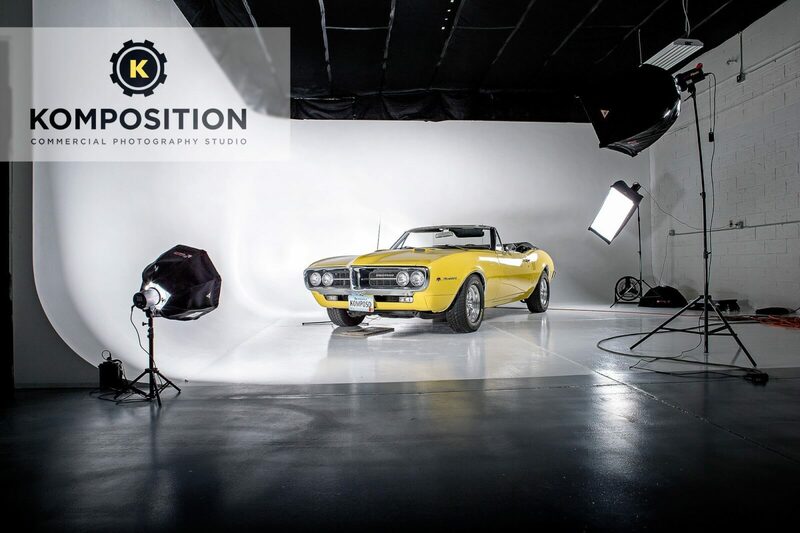 It looked great the first year, then in year 2, I noticed that where the car goes in and out, the epoxy was wearing away. I am not sure what to do. Do I try to spot paint, re apply the epoxy? The flakes make it feel textured already, so do I have to take it up, and if so…. how?